The Australian-born actor Errol Flynn was known for his romantic lead roles in films such as Captain Blood (1935) and The Adventures of Robin Hood (1938). He was also known for his colorful life off screen. In the new book The Young Errol: Flynn Before Hollywood (published by Trafford Publishing), Moore takes an in-depth look at the life of the young Errol Flynn to detail the budding actor’s rise to fame. “It’s an attempt to explain Flynn’s strange background,” Moore says about his biography of the Hollywood star. Building on Flynn’s autobiography, My Wicked, Wicked Ways, Moore takes care to peel back the mysteries surrounding Flynn’s childhood and adolescence. 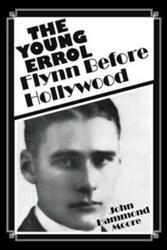 The Young Errol includes anecdotes as well as quotations from Flynn’s own diaries and from people who knew him. John Hammond Moore was born in Houlton, Maine in 1924. He attended Hamilton College and the University of Virginia and has worked as a journalist, editor and university lecturer in Australia and the U.S. His published works include some 50 articles in historical and popular journals in both countries. Moore lived in Australia from 1969 until 1971 and became interested in the life of Errol Flynn during a visit to Papua New Guinea for a professional conference in 1970.